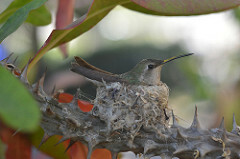 See an amazing video In honor of the Mama Hummingbird sitting on her nest just outside my kitchen window. She uses spider silk to hold her nest together. Baby hummingbirds life cycle from start to finish. Double click on the link below.